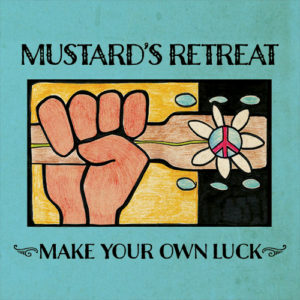 Mustard's Retreat – "Music to cure what ails you"
How nice!!!! Libby & I just had an amazing time last Monday night when we appeared on Rolling Hills Radio in Jamestown NY: what a fine show, venue, audience…community! There is really something special going on here, and it was so nice to be part of it! The entire show will be up on a podcast…soon….and then the full video will be posted a little while after that. For now, here is a performance of our song Root & Rain. We were honored to be interviewed by Michigan Radio’s Cynthia Canty on her Stateside show. If you missed it, you can listen here! Make Your Own Luck is available now!! Click Album Cover to buy now! Over more than 40 years making music together, Mustard’s Retreat has established a reputation around the region as a talented and entertaining folk duo — two guys and two guitars.